This is the first of a series of images I'll be posting from a recent trip to Tucson, Arizona. While the trip was mainly a family vacation, I did manage to fit some photography time in between and amongst the hiking and the other family trips. The Sonoran Desert was in great shape, with lots of spring wildflowers blooming in addition to the characteristic cacti (some of which were blooming as well). It was an amazing area to explore and I hope to make it back again soon (hopefully for a dedicated photography trip as well). Stay tuned over the next week for more images from the trip. 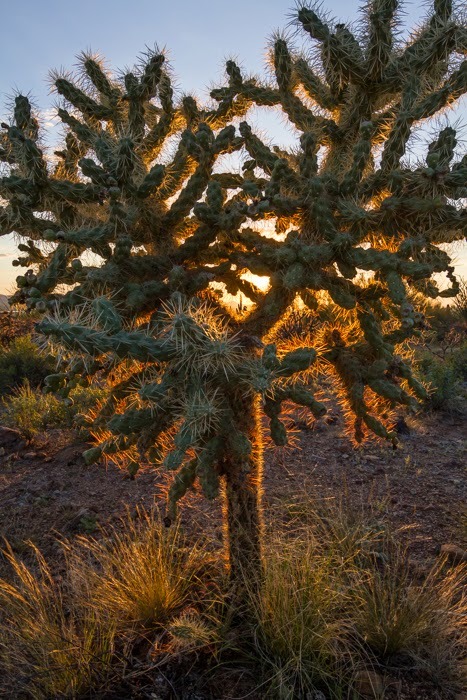 Also known as a "hanging chain cholla" or a "jumping cholla". But apparently that second one is used commonly for other cholla species as well, given their talent for catching folks with their spines.